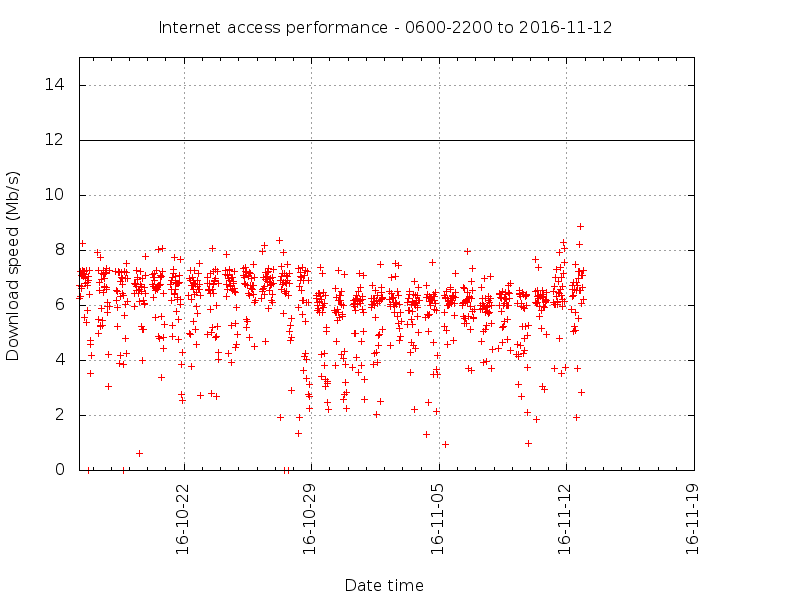 Our iiNet / FTTN NBN 12Mb/s service has been connected for just over a month now, and the first full month of download test results (ISP performance graphs) bears examination. 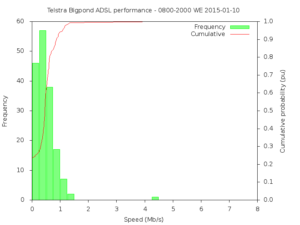 Above is a plot of the measured transfer rate of the test file from iiNet’s site. 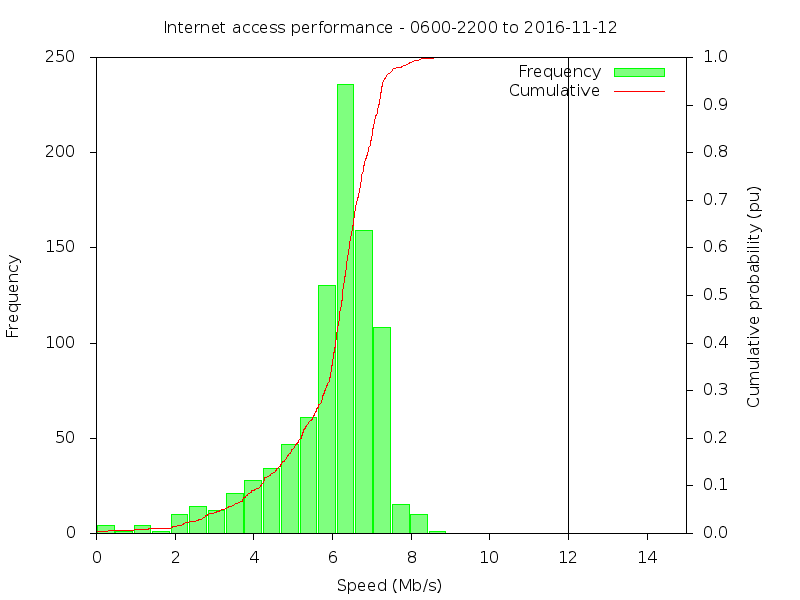 Above is the frequency distribution of the test speeds. The median speed was under 7Mb/s, less than 60% of the contract speed. 80% of the time, speed exceeded 5Mb/s (42%) and it never exceeded 9Mb/s (75%). By accounts of early subscribers to NBN FTTN services, the above is far from the poorest performance experienced. 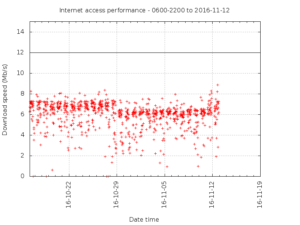 There are a host of possible reasons, but the most obvious one is that the CVC that iiNet buys from NBN to transport customer data between their point of interconnect (POI) and the subscribers is too small for the connected load and performance suffers. The CVC is a variable cost element in provision of NBN based service, and one that retail service providers (RSP) choose a capacity cost combination that sets service levels seen by customers on one site and service profitability on the other side. It is if you like the main opportunity for RSP’s the cheat the customer on service in pursuit of profit. So, don’t be misled into thinking that the 144 RSPs (from NBN’s list a few weeks ago) offer the same performance on say a 25/5Mb/s access since it is determined by NBN’s infrastructure. The RSPs choice of CVC (on NBN infrastructure) is critical to performance. We are seeking views about the factors that may prevent accurate broadband speeds information from being provided to consumers and how these factors may be overcome. 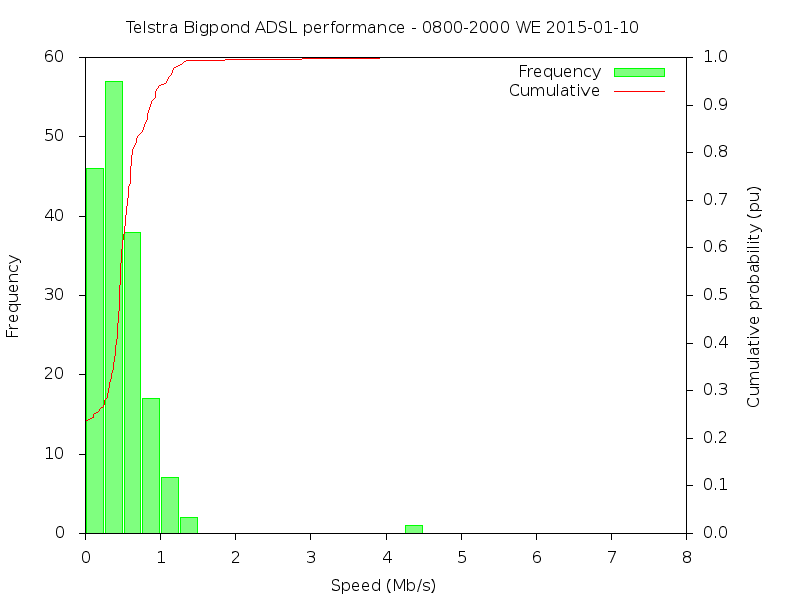 Above is Telstra’s performance on out 8Mb/s ADSL service in Jan 2015, and example of why there needs to be stronger consumer protection… but when the dominant access provider is a government owned ‘enterprise’ funded out of a growing budget defecit, it would be naive to think that government will regulate to protect consumers. The fundamental problem is that NBN based access is not sustainable at the speeds and prices offered, something has to give and it is to cheat consumers on speed.